Termites are a serious threat to the overall value and structural integrity of your home. In this article, we give you the six best termite treatments that provide long-term solutions. Read on to learn the six ways you can deal with and protect against termite problems in and around your home. How Do I Check if I Have Termites? If you are in the process of building a home—or planning a house to be built—you’re in luck. Pre-treatments are performed during the building phase of a home and are more effective and affordable before the physical infrastructure is laid. Pre-treatment is preferable when building onto an existing home as well. Have a professional pre-treat individual rooms, cellars, sheds and decks, to keep them from succumbing to future termite infestation. Pre-treatments involve a combination of liquid termiticides (see Liquid), termite bait (see Bait System), lumber treatment (see Wood), and an in-soil barrier (see Soil). These measures carry maximum effect when instituted in a home’s building phase. Wood and liquid treatments will vary in availability, depending on where you live and what is in proximity to your property, such as waterways, sewage drains, and wildlife sanctuaries, etc. 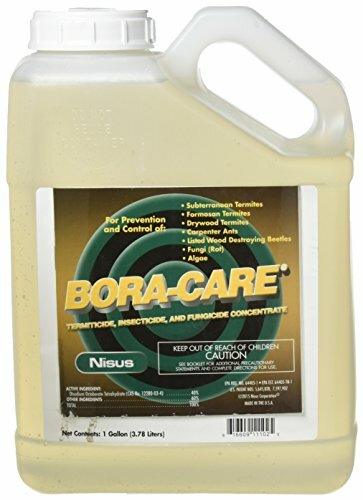 If you’re looking for the best termite pretreatment product, we recommend Nissus Bora Care Natural Termite Control, found on Amazon.com for under $60. It kills existing pests that inhabit wooden structures, and, protect against recurring infestations for decades. 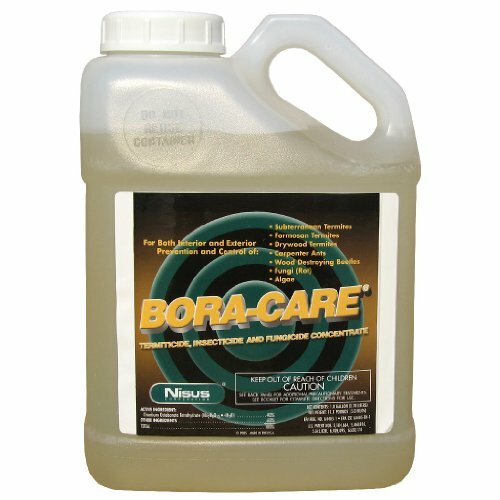 Bora Care is used as a spray or roll on treatment and is perfect for pre-construction termite prevention. Comes 15 to a box. Subterranean termites live in the soil around your home. Soil treatments serve to form a physical barrier in the ground between termites and your home. In a perimeter around your home’s foundation, a trench is dug. The soil, taken from the trench, is then treated heavily with termiticide before the trench is refilled. The best soil treatment implements an additional step. Before the trench is filled in with soil, a physical wall is constructed inside the outer wall of the trench. The barrier wall consists of rock, sand, mesh, and plastic. Then, the treated soil is filled in behind. This provides an added barrier between your home and the termites. If they make it through the wall barrier, they will die in the treated soil. However, this extra step is most applicable in a pre-treatment phase. 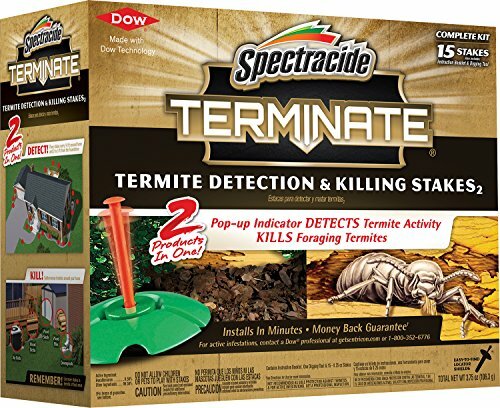 For a do-it-yourself termite soil treatment, the best solution that we recommend is the Spectracide Terminate Termite Detection Killing Stakes, available through Amazon. It includes 15 stakes which are placed around your houses foundation – about two to three feet away from the foundation’s edge. The stakes detect and kill subterranean termites that can make their way into your house through the ground. Spectracide Termite Stakes are easy to install, and the product comes with an auger with which to bury the stakes. Treats up to 21,000 sq. ft.
one gallon can treat up to 84,000 sq. ft. Liquid termite treatments are the most common type since it is an effective solution for infestations in a home’s interior. It involves drilling strategically placed holes into the foundation and wood. In conjunction with spot treatments, termiticide is injected into the holes, forcing termites to show themselves. They can, therefore, be exterminated by a spot treatment. Liquid treatment mitigates the habitable area of your home available to termites. The best liquid termite treatment that we recommend is Bayer Advanced Carpenter Ant and Termite Killer. Check it out on Amazon. Each gallon jug of Bayer Advanced can cover up to 84,000 sq. ft. for lawn treatment. The termiticide is non-repelling, so termites will pick up the poison and carry ot back to the queen. Sometimes all you need to deal with your problem is a quick fix, a way to prevent a termite colony from even entering the area. This aerosol spray from Spectracide is a good solution to kill off any termites in or around your house, without leaving a poisonous residue that can harm your family or your pets. The foam is especially good in damp places as a protection method for wood and similar materials that can be attacked by termites often, and it is easy to spread as to cover a larger surface, seeping into any holes and crevices the reaches. If you have found a nest somewhere in your home, and especially the garage, it is best to clean up the surface and any holes mechanically (literally just scrape off any termites you can find) and then apply the foam to the scraped surface, as to get maximum penetration into the wood. The foam acts quickly and prevents any termites from coming back for a couple of weeks, meaning that it is impossible for the queen to survive, making your structure termite free in a couple of days. 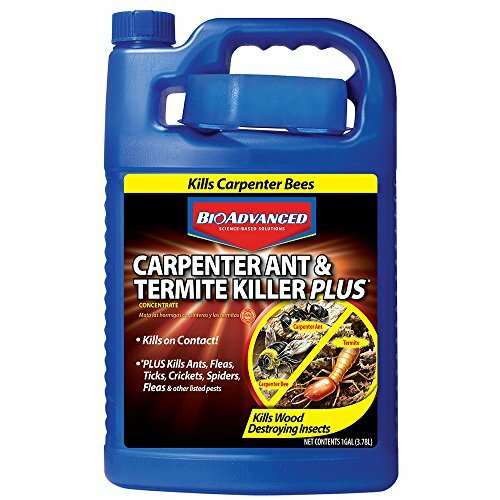 It is good to mention that this product also protects from carpenter bees and has also been proven quite effective against palmetto bugs, which, combined with termites are a bane of any Floridian and others who live in similar climates. Just make sure to take care of the applicator on the top, as it is not made from the best of materials, and you might want to use gloves and goggles when working with it, as it can irritate the skin, and especially the eyes of some people when used without protection. 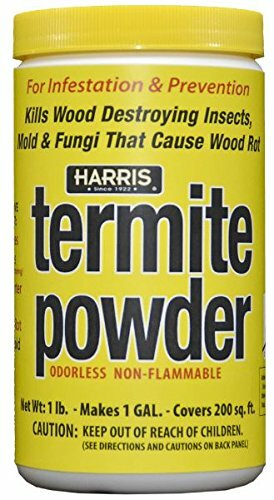 When you have a larger infestation or are at risk from such, or you eradicate termites as a small business, a powder is really the way to go. This small package is mixed with any water sprayer system and can destroy multiple nests and millions of termites and other bugs very effectively. Aside from the direct application to kill off pests, it can also be used to protect wood from both termites and mold, making it a perfect choice for protecting your garage, patio, porch, and similar places where there is a lot of exposed wood. The product is based on borates, boron oxyanions, which have been proven to work against multiple types of bugs, as they draw in oxygen from the wood, making it impossible to breathe for species that don’t have porous skin. Because of this, it is completely safe for all mammals, including children, but it is devastating for most bugs and especially termites that will always avoid settling into places that even have trace amounts. It is best to use this powder premixed with water in a sprayer. While a hand sprayer would be fine for smaller surfaces, for anything bigger, especially with prevention in mind, you would need a serious sprayer. Even though the product is not harmful to people, pets, and other wildlife, it can be very harmful to plant life, including grass, affecting its growth and any fruits and flowers it can make. When you are using it in the garden, focus on small bursts on desired areas, and when you are using it in the home, move your houseplants outside and then cover the area with the mixed termiticide. Can be used for active coverage or preventative treatment. Wood can be treated in several ways: sprays, foams, and Borate. Sprays do not soak into the deep grain of the wood and are, therefore, ineffective as a long-term solution. Foams are effective at keeping termites from penetrating the wood’s surface; however, they can still hollow out beams from the inside. Borate wood treatments are the most effective and are administered by pest control professionals. Borate is a long-lasting termite killer and repellent, which is soaked deep into the wood grain. It kills any existing termites on contact and prevents the colonies recurrence. Borate wood treatment is the best way to protect your home’s structure and interior from termites and is most effective in a home’s building stage as pre-treatment. If you’re planning on performing a wood termite treatment of your own, the best product that we recommend is BORACARE Nisus Borate Wood Treatment. A two-gallon container is available on Amazon.com, which acts to penetrate deep into wood grain, and provides termite control for years to come. It guards against subterranean, drywood and dampwood termites. Termites love old wood. If your home is too new to have rotting wood, termites can still find their way in; however, a spot treatment will be sufficient. Spot treatments are localized to an area of infestation. They are cheaper and quicker than full treatments and can be easily administered without a professional’s help. As with ants or bees, the colony can only be destroyed by killing the queen. Though hated by homeowners, termites are essential for the ecosystem. They perform the decomposition and composting of dead and rotting vegetation. Without termites, the forests would be ripe with smelly rot—up to your knees. This is a serious concern for buildings that are in the remote country, wooded areas, woodlands, state preserves, and national parks. Worse still, it doesn’t take a million termites to destroy a home. All it takes is a young colony of a few hundred termites to start chipping away at the integrity of your home’s supporting beams and floorboards. Termites cannot eat through your concrete foundation; however, they can squeeze between the smallest of cracks. If you live somewhere that gets a hot summer and cold winter, temperature changes will cause foundation slabs to form cracks over time—just like a driveway. Once termites are through the concrete foundation, they feast on the homes wooden floor joists. If your floors feel spongy, it is an indicator of termites in the floor joists, which means they made it through the foundation. The best early warning signs of an oncoming termite infestation, are in the garden or backyard. Termites will make themselves apparent outdoors, before migrating into the home. Your home’s property is prime for a termite infestation if your garden’s fence posts are losing structural integrity from rot, becoming misshapen, or if tree branches are falling unexpectedly. Termites will target any untreated timber, such as natural wooden posts and trees before they become apparent in the home. Subterranean Termites build mud tubes, which are made of dirt and their own excrement. They are not hazardous to health—unlike bat droppings—but anywhere there are mud tubes, there are termites as well. Check your home’s exterior walls for squiggly brown tubes that meander across the outer face. The first place termites will go is where there is a free meal. Begin with areas where you store firewood, lumber or any other natural wood substance that is placed up against the exterior walls of your house. At the end of the day, you will need a professional’s opinion in order to truly assess any damage. If you are worried about termites, but you don’t see any clear indicators—that doesn’t mean you’re in the clear—you still need a professional assessment. Termites hide beneath the surface.